Plantopedia is an extraordinary encyclopaedia of plants. I can’t speak too highly of this publication. It’s visually stunning, textually detailed, and overall a mine full of gems of information for all ages. Readers will be astonished by the names of the plants, which is one of the most interesting aspects of this incredible plant collection. There are maps to be found in the Homebodies section on plants that grow in one place. Each plant has been set out under headings that are humorous and entertaining, such as the indoor plants which clean the air - the Air Fresheners. The Aquatics are plants that live in water such as Water Mint, Watercress, the Western Marsh Orchid, and the toxic Bog Arum. The Healers are plants that heal - naturally. 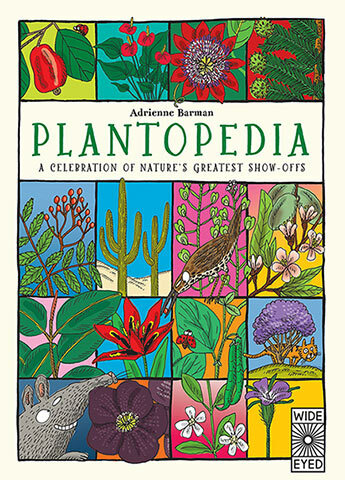 Every page is fully illustrated inside a black border and depicts the animals and people that depend on specific plants for life. The 50 entries full of brilliant colour and detail are represented in humorous and expressive comical spreads designed to attract and keep children’s interest. The Cereals section gives us maize, oats wheat, and millet, spelt barley, rye and buckwheat, giving younger readers the opportunity to learn about what they eat, where it grows and how. The Confused Fruits show us the fruits that think they’re vegetables. Everyone gets confused about this lot. The deciduous trees, the evergreens, plants that are used for dyes, garden vegies, and fruits you must peel before eating, are all shown in eye-catching detail. The garden vegies include all root vegetables and are shown side on in the earth so children can see how their roots appear beneath the soil. The Giants are Elephant Cactus, the Kapok and Banyan trees, Oregon Maple, Coco de mer whose seeds are the biggest in the world, and the Coast Redwood. I could wax lyrical about this stylishly publication but I don’t want to spoil the joy of discovery. It’s a valuable reference book that informs, educates and entertains simultaneously. Whether your first choice is a Strangling fig, an Autograph Tree, the Tropical, or the Transformers, or if you have an interest in leaf shapes, arrangements, veins and edges, you can track them down in the detailed index and glossary at the end.